Happy New Year– I mean, Anniversary! 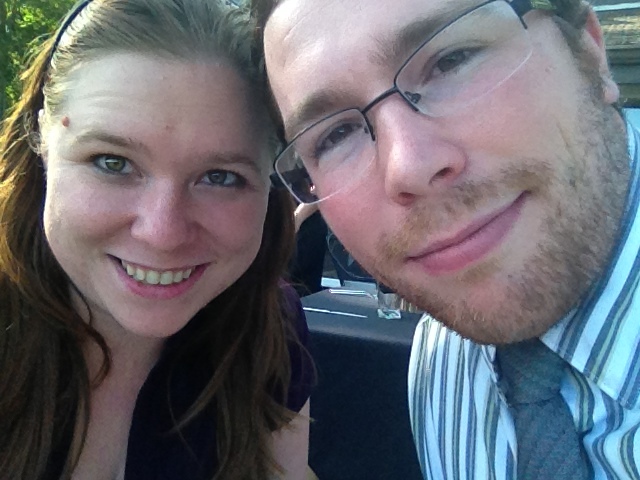 So at the end of July, the Hubs and I survived celebrated our one year of marriage. It really was a crazy feeling because this year had blown by so fast. Between getting married, moving to a new city/state, being unemployed and living off of freelance gigs and wedding money, him going to school and graduating, me finally getting a job, him finally getting a job, trying to make new friends and get plugged in at church, and all the while trying to change our lifestyle into a healthy one— it’s been a DOOZY. In fact, it was just a couple months ago that I finally felt like we had settled in. It’s been a lot to organize our lives together and learn how to find a routine. But alas, we celebrated (because we definitely deserved it… even though I was still sick) and we actually came up with something that I think will be a new tradition for us. We decided our anniversary would be our own personal New Years. Addison wanted a stay-cation for our anniversary, and since our anniversary was on a Monday, we spent the entire weekend “celebrating.” First he took me to the movies (which I LOVE) and then Saturday we spent the day reorganizing our life. But we didn’t just spend the day cleaning out things (my pantry looks FANTASTIC now by the way). We talked about everything about the past year and set up goals for our New Year. We went over our budget, we set short term and long term goals, we talked about how we could do things differently compared to last year and what really needs to be done to accomplish those things this year. And you know what? It felt really really good. When life can get crazy, it’s easy to just get swept away with it all. It’s easy to get frustrated or disappointed with where you are in the moment, and it’s easy to lose sight of your role in all of this. After all, you do have the power to improve your life. You just have to make the effort. Of course we didn’t just clean the whole time and be responsible. That Saturday of our awesome cleaning spree, Addison and I went to the Farmers Market (in the rain) to spontaneously make something for dinner out of whatever we found. 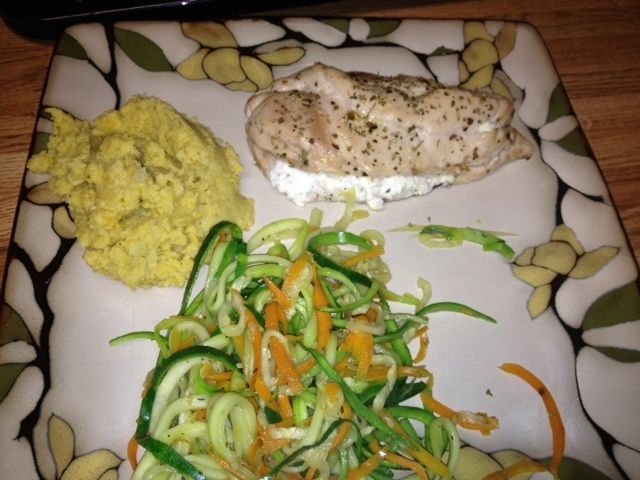 I made goat cheese stuffed chicken breast, mashed yellow cauliflower, zucchini and carrot noodles (which I made with my new toy/appliance…blog post to come!) 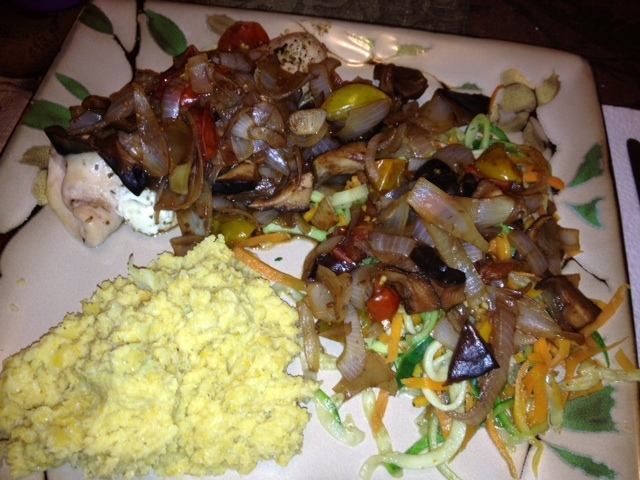 all topped with a balsamic reduction and onions and mushrooms. What can I say? I LOVE me some onions and mushrooms. Then on our actual anniversary, Addison also drove us 40 minutes away to a fancy restaurant that I went to with my parents when I was around 10 or 11 years old when I first visited these majestic mountains on vacation. I really wanted duck and I knew that would be the place to get it. 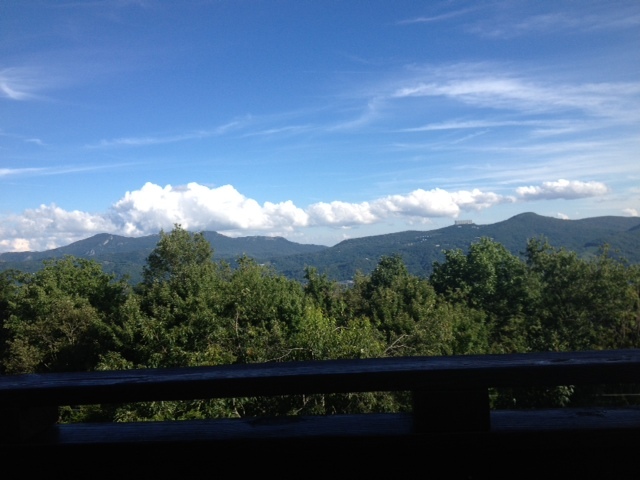 PLUS it has a fantastic view! The view from our table!!! 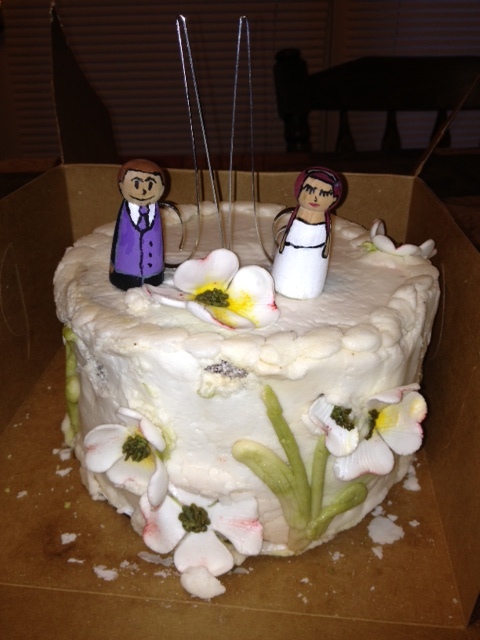 Then we ate our wedding cake topper ALL weekend. I was prepared for it to be terrible because all my other married friends said it would be. But I have to tell you— it was AWESOME. It tasted like a fresh cake. It was definitely special to have, and we even put our old toppers on it for decoration (by the way, if you live in the Greensboro/Pleasant Gardens area and need a cake, you NEED to meet my cake maker, Diane Fields. She commits to making only one cake a week so you have to book her in advance, but I seriously have never had such good cake and cupcakes before in my life. And the fact that it still tasted fantastic a year from when she made it was another testament to how great it was. Here’s her Facebook Page). Not bad for being a year old! But yeah, it wasn’t too shabby of an anniversary and I love that we’re treating it like New Years. We already got a temporary gym pass for the mega wellness center in our area to see how we like it. Today we’re going after work for Hubs to try spin class and for me to try out zumba! AND our house is actually clean (well at least the front!) But we’re definitely making progress! I must say, the perk to this being our New Year is that we don’t have to fend off all the other resolution makers at the gym :-p.